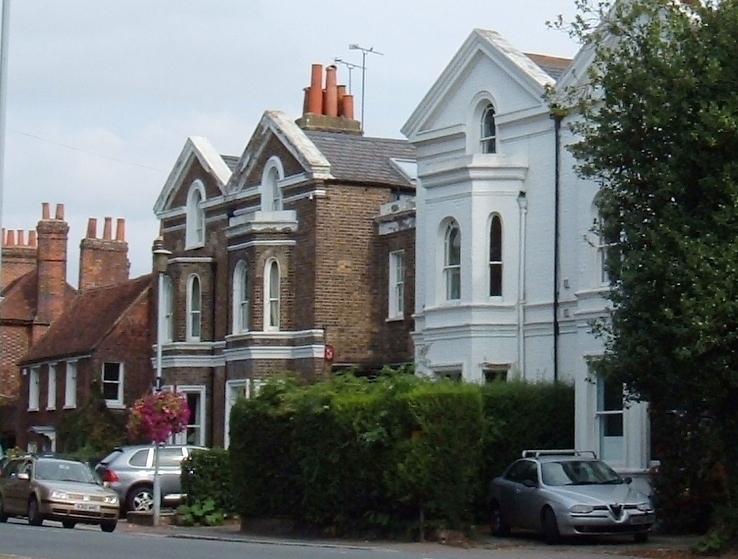 These two pairs of substantial semi-detached villas were built in about 1850 on the site of several very old houses and cottages which can be traced back to the 1590s as part of Robert Barker’s estate. 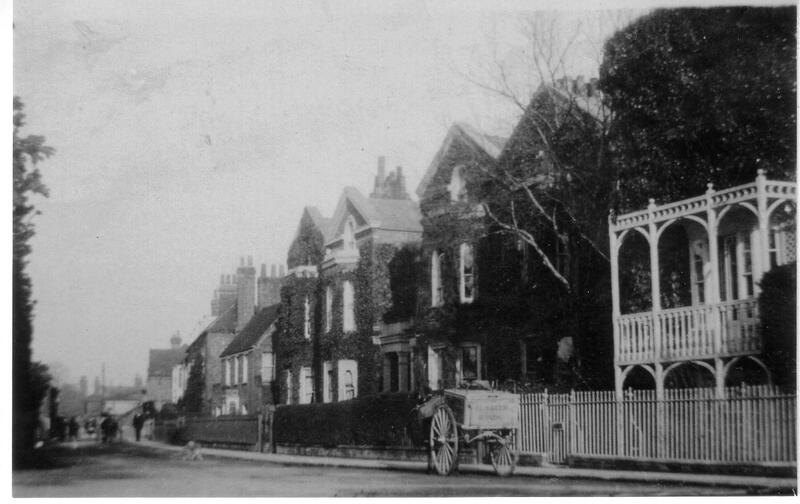 Since 1775 the cottages had belonged to James Haydock (who also owned the Old Bridge House and the Post House next down the High Street) and these new houses were built by his heirs for more profitable renting to high status tenants. The name Park Villas is original and was used from the 1861census, but other names are also recorded: no. 33 has been known as Cherry House, The Inch, and Park Cottage, while no. 35 was Parkhurst in 1901 and Jessfield by 1950. Number 37 has been known as Greenfield and 39 as Threeways. The most notable recent occupant of Park Villas is Sir Robert Watson Watts who lived at number 33, The Inch, for a few years around 1930. His work at Ditton Park on the development of radar was crucial to Britain’s wartime defences. This photo is of him with the original British Radar Apparatus made at Ditton Park in 1935, which is now in the Science Museum in London. Mrs Caroline Alicia Dalton bought The Inch in 1931 from the Watson-Watt family, renaming it as Cherry House. She lived there until her death in 1944. Her husband Canon J N Dalton was chaplain to Queen Victoria and tutor to the future King George V, and their son Hugh Dalton (1887  1962) was a Labour Party politician, and Chancellor of the Exchequer. We have to report that Mrs Dalton of Cherry House has died aged eighty. She and her distinguished husband Canon J.N.Dalton lived at Windsor Castle for thirty six years. After his death she and her friend Mrs Battye came to live at Cherry House in the High Street, where she was honoured by visits from King George V and Queen Mary. Patrick Manley recalled Mrs Dalton as wearing elastic-sided boots to the end, and she was so delightfully vague that it was said of her, Here is Mrs Dalton, come out to see whether she has come in again. The occupants of these houses illustrate how Datchet began to change after the railway arrived in 1848. In the later Victorian period foreign merchants, the legal professions and the comfortably retired predominate throughout the village in the grander old houses and the new ones as they were built, Park Villas being the first of these. 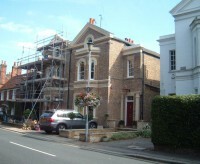 New roads such as The Avenue and Montagu, Eton and Buccleuch Roads were not developed until the 1870s and 1880s, so Park Villas were particularly desirable in the 1850s and 1860s. John Heaton was a stalwart of the Parish Council and of the village generally for many years. In 1895 he was elected Chairman of the Council and Percy James de Paravicini (brother of his neighbour at Park Villas in 1901) was elected Vice Chairman. 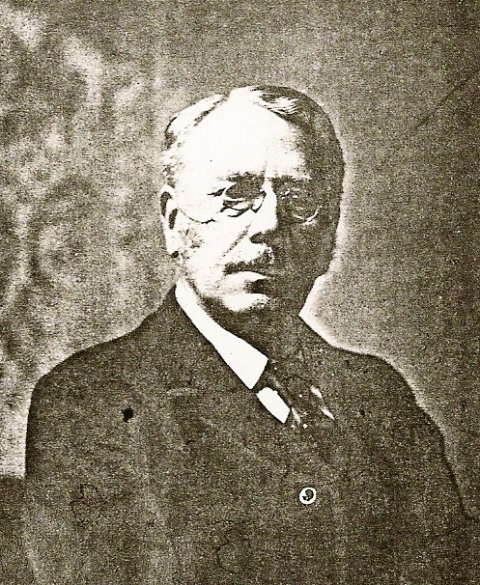 Heaton was a very pro-active Chairman during the difficult early years of the Council. Parish Councils were first established across the country in 1894 and there were a great many arguments among Datchet’s councillors before their responsibilities settled down. He was also on the committee of the Working Men’s Club (now Library) and this photo of him hung there until quite recently. Kelly’s Directory last records him at Park Cottage in 1924. A valuable estate, part copyhold and part freehold, desirably situated in the pleasant and admired village of Datchet, comprising a modern genteel residence with garden near the bridge commanding delightful views of the river, park and garden. Also a comfortable cottage retreat with large garden adjoining the same`, and seven smaller cottages with gardens and yards, altogether presenting a desirable spot for the forming of an elegant and spacious residence. 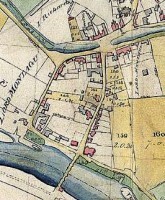 The site of Park Villas was bought by James Haydock in 1775. He also owned Old Bridge House, with the Post House, and built Datchet Lodge in the 1770s. The site then consisted of five cottage dwellings within two old houses, occupied by the poorest tenants. The Express advert demonstrates that the site was being seen as ripe for development for more than thirty years before it actually happened. From the 1780s and at the 1841 census the old cottages were called ‘Coblers Square’, possibly having the same meaning as the Cobler at Windsor; a boat landing stage or wharf rather than the dwellings of cobblers who mended shoes. This could make sense on a site so close to the traffic on the river for hundreds of years All the 1841 inhabitants were extremely poor and the cottages must have been ancient slums by the time they were demolished. 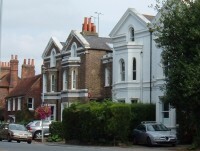 It was not until about 1850, long after Haydock’s death in 1802, that his heirs capitalised on the valuable plot by developing it as two semi-detached villas. These remained in the ownership of the Haydock Trust (which was a very complicated affair) until the end of the 19th century. The Haydock property deeds are unusually confusing because they all rely for legal title on a deed of 1575 which could not be definitely related to any of the four properties, with the result that it was cited in transactions for all of them. Lawyers dealing with the early deeds (full details under Old Bridge House), eventually added ‘boundaries unknown’ when citing the description in the 1575 deed: all that piece or parcel of land with barn & stable & 1/2 acre land in Datchet by the ferry. Whichever property that might once have referred to, it was not the Park Villas site because that has a completely different and well-documented history going back to the Lascelles estate of Southlea, once owned by Robert Barker. 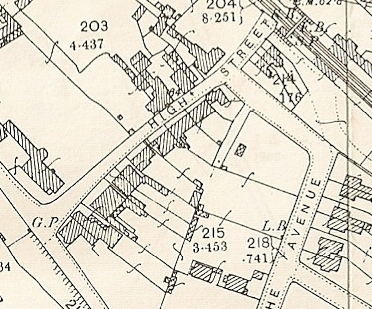 The copyhold sequence of owners by which James Haydock acquired the Park Villas site (as well as Old Bridge House and the Post House) in the 1770s leads back to Edward Lascelles, a London merchant related to the Lascelles of Harewood who had in 1709 inherited a huge estate of land and houses scattered throughout Datchet. It originated in the acquisitions of Christopher and Robert Barker, printers to Queen Elizabeth, from the 1590s. The core of the estate was at Southlea where they may have lived at the (demolished) Southlea House, but the Barkers had also bought every dwelling or piece of land which became available. Robert had overreached himself as he did in every walk of life (see separate Barker family article on this website) and before his death in 1645 the estate was mortgaged to one of his sons-in-law. When after a series of sales and bequests the estate came to Edward Lascelles he seems to have rationalised the holdings. Within a few years he sold off those houses and cottages which did not have land attached (particularly several in the High Street) because agricultural land was valuable but cottages were not and had to be kept in repair. The Park Villas site was sold by Lascelles in 1718 and was eventually bought by Haydock in 1775, while Old Bridge House (with the Post House?) was sold by Lascelles in 1723 and bought by Haydock in 1773. In 1709 this description was used in exactly the same form when it was acquired as part of the Lascelles estate. For the earlier history of this property we rely on the records of Datchet Manor. The manorial system was based on the feudal view that all land and property technically belonged to the Lord of the Manor (and through him ultimately to the Crown) and all transactions were dealt with by the Manor Court. The minutes of the court’s proceedings (Court Rolls) detailed all sales and changes of ownership or tenancy, so that if a property can be identified at all, a complete record may exist from the mid 16th to the late 19th century. 1) Freehold, by which a payment was due to the Lord when a sale took place. Very little information was required or recorded at the Court session and full deeds were held by and passed on through the sequence of owners; freehold properties are thus difficult to track unless a full set of deeds are still in existence. 2) Copyhold, by which a property was held by a copy of the court proceedings, not a full deed. The system was that every time a copyhold owner died, inherited or wanted to sell, the property was formally ‘surrendered’ back to the Lord and then, with due ceremony, the next owner was formally ‘admitted’. Each transaction of a copyhold house or land (such as this property) was accompanied by a description which seldom changed over the centuries and so can sometimes, with luck, be tracked back and forward.